It’s not the light that I recall from those days, however. I remember the smell. Anyone who has been there often would probably, if plopped down blindfolded on a Paris street, instantly identify it. A dank odor, a strange amalgam of rot and gas, wafting up from those famous Jean Valjean sewers accompanies the Parisian flaneur wherever he goes. The scent of dog excrement and scrub water joins in to make an inimitable blend. It’s unpleasant, but when I go there now, each whiff brings back that uncomfortable, nerve-wracking, and eye-opening time. Leaving the leaden winter skies of the Paris streets for the Metro gave another kind of sensory experience. As you descended though the half-light of the stairs, a pungent combination assailed your nostrils: the odor of rubber tires, oily mechanical engines, and fetid air combined with a certain stink of Parisian metro passengers, hard to identify. The garlic-laced diet of the French may have been a factor. The year was 1964. Back then Europeans bathed and laundered less often, out of habit and because of the expense. In fact, I found out to my horror that I was allowed one bath a week by my French family. Exotic food odors wafted from the bodies and combined with the whiff of hair pomade from the omnipresent young male North African immigrants. These kids were friendly and harmless for the most part, though occasionally after trying for several Metro stops to talk us into going out together, they followed us out of the train and onto the street. Walking around the Place du Trocadero a few times adequately discouraged them. I was surprised though when my comical red-haired friend from Birmingham, Alabama, acted as if the world was ending because she had been followed at the Cite Universitaire by a dark-skinned African man. “Oh mah god!….” Her dramatic reenactment of the situation made us howl with laughter, but I remember thinking she was overreacting, even if the kissing noises these people made every time we walked down the street were a bit disgusting. Thus I became aware that girls from the south looked at some things very differently from the way I did. Girls of our age were shocked by a less innocent situation during rush hour in the Metro cars. Occasionally dirty old men took advantage of the cramped conditions to let their hands wander as if in error. A victim was lucky if she could figure out whose hand it was and glaring, step down hard on his foot, but most of the time, the only solution was somehow wiggling away, “Pardon, pardon!,” not an easy task when you were being flattened and pressed by bodies on every side. All of these sensations are nothing compared to les pissoirs. Fifty years ago the old open-air urinals emitted such a putrid stench that the minute one came into view, one grabbed for fresh air and holding it hard, walked urbanely by fast enough to get past without keeling over. This is not easy to do on a crowded Paris street. You averted your nose but also your eyes because to see male legs below the knee-high rounded metal wall was to bring the reality too close. 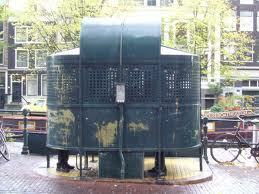 I read recently that these pissoirs are nearly all gone. An indelibly pungent landmark of a great city will be missed, if only by me. I was there during one of the years of the great cleaning. Paris in the fifties was black. Over hundreds of years, the buildings of Paris, mainly cut from huge white stone blocks had been blanketed by a patina of smoke and grime. In 1964, the government had determined to reawaken the city by conducting a full-scale sandblasting of its buildings. To avoid an inadvertent drenching, we pietons had to walk as quickly as possible underneath scaffolding and sheeting that kept the fine spray away. We accepted as normal the swirling clouds of water filled with miniscule grains of stone that filled the air. Gradually throughout the sixties, black and white buildings alternated with the appearance of an old film negative. When I went back many years later, the center city shone like ivory, shocking to me and not altogether an atmosphere I liked better. Other impressions from my year are spring days in the Jardin Luxembourg, walking on the gritty sand paths where small lacy-leaved trees were precisely planted in geometric patterns. Exhausted from walking all over the city, I would often perch on a small metal chair, the design of which is peculiar to Paris parks. Immediately, a little old woman dressed in black would descend upon me asking for a small amount of centimes for the privilege of sitting there. Being on a budget and indignant at being asked to pay to sit in a park, I would always get up and move on, no matter how tired and sore my feet were. The last time I was in Paris, I looked around anxiously for her, but no one appeared to ruin my relaxation. You could sit to your heart’s content without the uneasy feeling of being pounced upon. One might think that a small town 18-year-old girl from the Midwest would be daunted by the raucous Paris traffic, but I adjusted quickly. I watched and learned to run across a busy street with many lanes in both directions, judging whether I could beat the phalanxes of cars, taxis, and buses bearing down on me. Even in heels, there was no great worry about whether I was going against the light or with it. No one else was paying attention to the law, so I learned to scramble and ignore the constant tooting of the horns, intermittent shouts, and irate gestures. What a contrast to my sedate retired self who looks both ways twice and always crosses with the light in quiet, peaceful Madison. Some of my adventures in Paris proved that I was out of my depth and years later I questioned the wisdom of my mother in sending me there at that age. Many people have been shocked that I was basically alone there at age 18, even though supposedly chaperoned by a family and the administrators of the group I was with. I felt safe the whole time because I was too naive to realize I could be in danger, even when bad things happened. The anger the French often exhibited did make me uncomfortable and angry myself, but seemingly irrational incidents like being run off the banks of the Seine by students who did not want us to watch them make floats just astonished me. We were incredulous when French plain clothes policemen told my roommate and me to go home because anti-Vietnam-War protesters were approaching, shouting, “USA, assassins.” We went though. Looking back at it now I realize I was given a gift that I did not always take advantage of, and I should have been more grateful. Of any year of my life, that was probably the one in which I made the largest strides toward growing up. I never went home again for more than a short visit, so unbeknownst to me, I was on the way to an independent life. Susan Daugherty spent the year 1964-65 in Paris attending the Sorbonne sporadically, seeing The Animals sing, and attempting to learn the French language, only partially successfully. Since then, she has gone back whenever possible. She is a retired librarian who lives in Madison, Wisconsin.